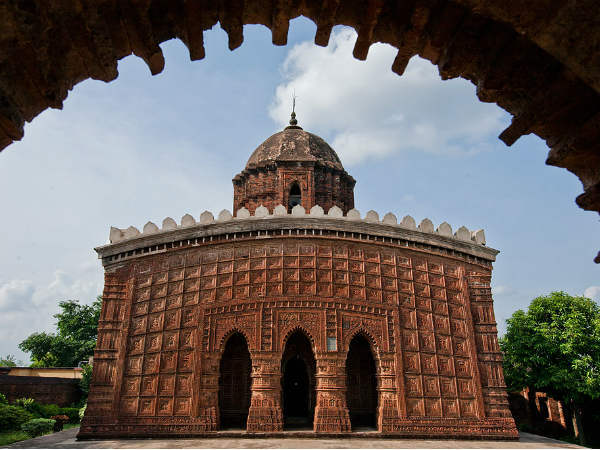 Bishnupur is one of the most popular weekend getaways from Kolkata. Being easily accessible, it is visited by thousands of tourists per year. Bishnupur is immensely famous amongst tourists and travellers for its terracotta temples and other ancient buildings. However, it is also well known for the production of Baluchari sarees, which are adorned with several mythological drawings and scenes from the Puranas. Even though the exact history of Bishnupur is still unknown, it is believed that it has been in existence since the time of the Gupta kings. Later on, it was ruled by Malla kings for more than thousands years. The presence of several ancient monuments and historic buildings certainly proves its age-old history. So, how about planning a trip from Kolkata to Bishnupur this season? As the summers are hot in and around the region of Bishnupur, it is advisable to visit this historic town around the winter season when the temperature is average and the weather is cool and pleasant. Hence, the best time to visit Bishnupur is from October until the end of April. By Air: The nearest airport from Bishnupur is at Kolkata which is located at a distance of around 180 km. By Rail: You can catch a train from Kolkata railway station to Bishnupur Junction. It will take you an approximate time of 5 hours to reach Bishnupur. By Road: Bishnupur is well connected to Kolkata and nearby cities by road. However, route 1 is preferable as it is in good condition with beautiful en route destinations and hence, it is more comfortable in comparison to other routes. Bishnupur can be reached within 4 hours by route 1. On your way to Bishnupur, you can take a break at Bardhaman and enjoy its beauty. Bardhaman is believed to one of the oldest-living places in the state of West Bengal and is located at a distance of around 100 km from Kolkata and 80 km from Bishnupur. It is famous for its beautiful gardens, ancient temples and the Damodar river. Due to the presence of Damodar river, it is also a famous picnic spot amongst locals. The major places to visit in Bardhaman include 108 Shiva Temple, Burdwan Church, Curzon Gate, Damodar River Beach and Hawa Mahal. It is the perfect place to take a break en route to Bishnupur due to its peaceful surroundings. Eventually, after covering a distance of around 180 km, you will be in the beautiful town of Bishnupur. As this historic town is immensely popular for its terracotta buildings in the form of temples and mahals, you will have a lot of places to explore here. You can also discover the beauty of its natural surroundings which is scattered in the form of green hills and thriving plains. Following are the major places which you must not forget to visit while in Bishnupur. Undoubtedly, Rasmancha is the most recognised building in Bishnupur due to its historical and architectural significance. It was built during 1600 by Hambir Malla Dev and was considered a site of religious importance, as during the Vaishnava Ras Festivals, the idols of Radha and Krishna were brought to Rasmancha and worshipped by the public. Rasmancha is the oldest brick temple in the form of a pyramid and is built in Bengali Chala architecture. You must visit this masterpiece from ancient India while in Bishnupur. Madan Mohan Temple is one of the most visited monuments in Bishnupur on account of its architectural beauty and structural formation. It was built in 1694 by Durjan Singha Deva, the Malla king of Mallabhum. It is a square-shaped temple with carved ledges and a flat roof. It is surrounded by beautiful well-maintained gardens, which help in beautifying its charm. If you are willing to move a little far from the main town of Bishnupur to enjoy natural surroundings, then Susunia hill is the place where you should go. It is famous amongst tourists for its lush green beauty and rough terrains which also attract several mountaineers and trekkers. Susunia hill is also known for its archaeological importance as the oldest rock of West Bengal, with inscriptions, is located here. Due to its beautiful environment, it is a perfect place for camping too. Also Read: Ashoka's Rock Edicts - Unravel The Mystery! Jorebangla Temple was built by Raghunath Singh in 1655 and is one of the most beautiful terracotta buildings in West Bengal. With Chala style of architecture, Jorebangla Temple is adorned with beautiful carvings and drawings on the wall and is surmounted by a pinnacle. You must visit this marvellous piece of architecture if you love exploring things from the past. Apart from the above places, there are several other places of interest in Bishnupur. As this ancient town is famous for its temples and historical monuments, there are myriad places which can definitely interest you. The list includes Jor Mandir Complex, Stone Chariot, Hawa Mahal, Radha Govinda Temple and Panchchura Temple.